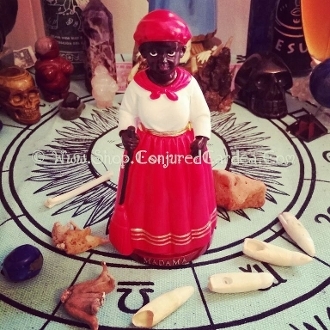 This 5 inch La Madama is perfect for any altar, large or small! La Madama is a popular spirit in spritism (espiritismo). She is honored by spiritual workers, fortune tellers, and diviners, and mothers. She is depicted holding a broom or basket; the broom sweeps away the negative energy of clients and sweeps in good fortune. The basket is to place offerings in. She brings business and gets timely payment for services. She provides love, luck, and protection for the home-she is my favorite spirit to work with. She is nothing but kind and full of blessings. La Madama spirit was contained in the cloth dolls that were made for slave children who could not afford china dolls like white children. This doll was very precious, because even having spare cloth to make a doll for a child was rare for slaves. If the child was separated from her mother, as often happened during that time, the child was left with the madama doll that represented their mother. The child would keep the madama doll hidden away, so she could not be stolen or destroyed. During hard times, the child would take the doll out, and talk to her knowing that the doll was connected to the real mother's spirit. La Madama's job is to set everything right, to provide protection, keep harm away, and to provide wealth, health, and luck to the home. She provides all kinds of goodies if you invite her into your home and petition her for a favor.